Four films from Kamran Heidari, well-known Iranian filmmaker is now playing at the Spectacle movie theater in New York. Kamran Heidari was born in Gachsaran, near Shiraz in 1977. He is a freelance documentary filmmaker and photographer, with an Interest in street photography, graffiti and ethno-music. 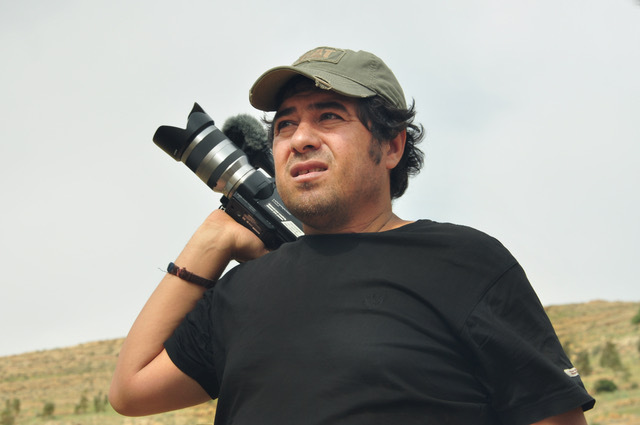 His work focuses on film and photography about the people of Shiraz (Fars Province) and the south of Iran. ‘My Name Is Negahdar Jamali And I Make Westerns’ (2012), his first feature length documentary was screened in many festivals around the world, among which Busan International Film Festival and Rotterdam. His latest work ‘Ali Agha’ premiered at IDFA in 2017. ‘Ahle Hawa’, his current project would be his fifth feature length film. At Cinema Without Borders we had the opportunity of having an exclusive interview with Kamran Heidari about his four films that is screening in New York. Bijan Tehrani: Your cinema is beyond what we know of documentary cinema and we can see your presence and mindset in these works. What do you think? Kamran Heidari: There are times that in making a documentary you have to be just an observer, but only being an observer is not working for me because the story I like to tell might not come out well that way. I always like to tell stories. It takes a lot of time to build up the story with only being an observer. That’s why I think my presence as a storyteller can be more effective and I try to have my own structures for storytelling. BT: Music is very important in your work. Maybe we only don’t experience it that much in “Ali Agha” but in the rest of your films the music plays an important role. How do you describe music and its effect in your work? KH: One reason could be music has been always in my life. I am from Ghasghaei nomad and music is vital between nomads. Besides, I’ve lived in the south of Iran, so I’ve always enjoyed the southern music. That’s why I like music, especially the music from the south, because it is very similar to that of in Africa, to Jazz and Blues. I have also a Telegram channel and Instagram page dedicated to the music. As a documentary filmmaker, my interest in music is vivid in my films and I like making and watching music documentaries. BT: The interesting thing for the audience in your work is the discovery of Jazz in the South of Iran in places such as Bandar Abbas combined with great performances. Is this something that you chose to focus on or is there really a strong jazz performance in those areas? KH: It’s always a pity for me that I must be selective when it comes to choose only one artist due to the time restrictions of a film. I often film a lot of musicians for my personal archive which are great performers. I can say, 1 out of 10 Bandar Abbasi locals plays guitar. BT: How do you see your progress as a filmmaker from Dingomaro to None of Your Business? Did you find anything new? KH: I filmed Dingomaro with much excitement even though I knew the south very well because I used to travel there a lot. That’s why you can see my awe and wonder in the film. But in None of Your Business which I made 3-4 years after Digomare, and during this time, I traveled there a lot and became friends with the musicians. I got to know all kind of music existing there, whether it is the modern music or the traditional music like the ones for wedding, Zār* and fishermen music. Therefore, for None of Your Business it was easier for me to process the music and culture and I was able to be selective which helped the story a lot. I think None of Your Business has a better storytelling. I made Dingomare for ARTE TV and my directing was more toward TV style but in None of Your Business I tried to be more artistic. BT: Characters of your films are quite unique and exceptional, they are mostly marginalized. How do you choose them and why? KH: I do street photography and in the street photography, I need to search a lot to find a subject that stands out and is different. The patience and persistence are the habits I got from the street photography. Besides, current political and social issues are not that interesting for me in even though I like to follow them. So, I try to find characters who are especial and have potentials of a good storytelling. Furthermore, I like to have more audiences for my documentaries and get my films screened in the theaters. It’s hard for documentaries compared to narrative films to find public screening. Most of Iranian documentaries are made for specific festivals or audiences. I like to make my films in a way that would be interesting to the general audience That’s the reason I choose aforementioned characters so that the general audience can relate to them easily. BT: Your style is very outstanding. In often cases, many Iranian filmmakers follow the common practice of Iranian cinema etc. Asghar Farhadi’s style but in your work, there is an independency in style. How did you develop this style? KH: I haven’t thought about it. Maybe it’s instinctual. I don’t consciously choose to work with a specific style. It could also be the way I live which is similar to my characters. I try to avoid generalizing ideas and concepts. My subjects are suggestive of how a film should be made. I try to free myself from film theory and merely rely on my characters in my films. BT: In Dingonmaro, None of Your Business and Ali Agha, opening scenes, the camera captures a long shot with voice-over and that creates a special mood and make us ready for an exciting film and the type of shots for framing the character makes us to see the world that we feel is outside of us and yet it is very exotic. What do you think? KH: When I choose a subject, I do a lot of research and live where they live before shooting starts. So, I don’t have that wonder that audience might have because I have already learnt about the way my characters live and their behaviors. Since I edit the films myself, I try to share the visual beauty with my audience so the audience can feel the subject and relate to the characters. That’s why the style that you mentioned is used so the audience can relate easily to my characters. Also, recently, I am interested in aerial shots, not the drone shots, the ones which show the geographical situation. BT: You do all the research, filming and editing. The risk of editing your work could be avoiding to get rid of redundant shots. How do you manage that? KH: I usually edit the footage without any emotional attachment to it and while editing, I don’t think as a cinematographer or a director. First, I make a rough cut with the focus of creating the story. If I get a 100-minute rough cut, based on my experience, it should make a good 70-minute film. Now I start removing scenes to establish the ideal time. The most interesting part is finessing the fine cut that I start to remove the extra shots. At that moment I only focus to think how my audience would react to the shots in the story, I’m only an editor at that moment. BT: Ali Agha is reminding me of Italian Neo Realism; it’s also a very bitter film. The character is very confident and easily talks about his life in details which is to say it is astonishing. How did you find him? KH: I had a photography project in Friday Bazar about people that sell doves and pigeons. I’ve been taking photos of that place for about 7-8 years each Friday. I met many people owning pigeons who invited me to their rooftops to take photos. I was looking for a character that’s comfortable in front of camera, so I can get close to him in order to develop his character for telling the story. When I met Ali Agha, I went to his rooftop to find out what stories he has in his life. I went there for 10 sessions and I realized that he was quickly became unaware of me and my camera. When he was involved with his life and his birds, he would completely forgot about everything else. His diabetic problems and the way he dealt with it by trying to ignore it, had given a new dimension to his character. Therefore, I decided to work with him. But I didn’t tell him first. I was going to his place to film for three months and at the end of the third month, I was even helping him with his birds, feeding them or cleaning their cages. We had somehow a master-disciple relationship. Then, I asked him about making a documentary and he accepted. I started filming based on the ideas that I had like his diabetic problems, his love for his pigeons, and his ongoing fights with his family members. There were other interesting things in his life, too, but it could be distracting to the story, so I only focused on those 2-3 topics. To them I was just a friend, Kamran, not a filmmaker. My camera was small, and my sound man usually sat at a corner with a distant to everyone and he was very friendly with them as well. All this together made it easy for them to see us as friends not filmmakers. We were going there 4-5 days a week, but they wouldn’t notice the camera even though we were filming. BT: I think None of Your Business is a very beautiful film. It takes a lot of courage to make film about a deceased singer by having his as narrator of his story. To me, None of Your Business is a visual poem. How did you choose this structure? KH: I knew this character from 10 years ago and listen to his music. I contacted certain friends of his and asked about Monsefi’s life stories. There were a lot of stories about his life. I thought it’s much better to focus on only 2 or 3 events in his life. Naturally, it’s very hard when your subject has passed away. The only way was to talk to his friends. Since I love visuals, I didn’t want to spend too much time on interviews, talking heads telling their memories of Ebrahim Monsefi. I thought what would be left if I remove all the interviews? It made me think it’s like literature. I wrote the stories of the film based on true events in his life. Then I thought, how would Ebrahim Monsefi talk about himself? So, I read his books. He has three books of his poems and I took notes of the parts that were about his life and wrote stories based on those poems. Then, it just occurred to me to let him tell his own story in the film. Magic realism like the ones in the South America and Gabriel Marquez’s work somehow exist in the Southern Iran, too. Ebrahim grew up in a Hindu temple and believed in reincarnations and he even talked about it in his poems. I was a little worried if I could develop the story without his friend’s interviews and archival footage. It was a bit difficult, so I thought he would say at the beginning: “Even though I passed away, everyone in Bandar Abbas is playing my music. Therefore, I am still alive.” I worked each story with a musician who played his music. It made it easy. It took 2 months to write a narration. Luckily, we have got a lot of good feedback for the film so far. BT: What will be your next film? KH: I’m working on an exciting project. I am filming one of the characters in Dingomaro, Gholam Zarei who dances in the stadium and Zār ceremonies. He is so called “Ahle Hava” (Air People) and have been captured by magical and mysterious wind Zār. They think there is air in their bodies, so they perform a ceremony to control the air in their bodies. I’ve been filming him for three years now. Last year I had long sessions of filming. This year I spent 4-5 months in the south filming. It’s a very exotic film because it’s about the Africans in the South who came to Iran 800 years ago from Zanzibar**. In my story my lead character, Gholam’s ancestors’ souls have come from Zanzibar. We have finished filming in Iran and we will be filming in Zanzibar. Gholam has never been in Zanzibar, and he likes to see how it is there. The story is more about the people who think that there a mysterious air have captyred their bodies; very similar to the famous book of the late Dr. Gholamhossein Saedi, “Ahle Hava” and Nasser Taghvai’s short documentary film, Wind of Jinn (Bade-jen). It is very similar to the magic realism of Africa and South America. ** Zanzibar, is a semi-autonomous region of Tanzania. It is composed of the Zanzibar Archipelago in the Indian Ocean, 25–50 kilometres (16–31 mi) off the coast of the mainland and consists of many small islands and two large ones: Unguja (the main island, referred to informally as Zanzibar) and Pemba Island. The capital is Zanzibar City, located on the island of Unguja. Its historic center is Stone Town, which is a World Heritage Site.